Drugs Side Effects Potential side effects of epinephrine injection include: anxiety, palpitations, nausea and vomiting, respiratory difficulties, arrhythmias, rapid blood pressure rise and cardiomyopathy. Device Complications Reported auto-injector complications include: failure to function, accidental injection, bent or embedded needles, injection site infections, sulfite allergy reactions. Reports of EpiPen complications have increased dramatically since Mylan redesigned the life-saving drug-device combo in 2009. The most common complaints have to do with the device either failing to deploy correctly or accidentally exposing people to epinephrine. An EpiPen can be a life-saving drug-device combo for someone having a life-threatening allergy or asthmatic attack. It can fend off anaphylaxis, a condition in which blood pressure drops and breathing becomes difficult. The auto-injector delivers a precise dose of the hormone epinephrine — also known as adrenalin — which can provide temporary relief and give a patient time to seek medical attention. EpiPens combine a medication with a medical device. The medication, epinephrine, can cause side effects such as headache and dizziness. And it can be dangerous if used at the same time as certain other drugs. The device itself also can cause complications if it does not work properly or expires. Hundreds of people reported serious complications after device failures between 2009 and early 2017. In March 2017, EpiPen’s manufacturer recalled more than 80,000 possibly defective devices shipped to Europe, Japan, Australia and New Zealand. About a week later, the company expanded the recall to include 13 lots of the devices shipped to United States pharmacies and health care facilities. The expanded recall also affected other markets in North and South America. The U.S. Food and Drug Administration has received reports of both drug side effects and device complications for EpiPens because of its combination design. The four most common complications reported to the FDA account for about 80 percent of all reports involving the pens. Some of the most common complications are also among the most serious. As of June 2018, the FDA had received 2,810 adverse event reports related to the devices since 1993. The agency categorized more than half as “serious cases.” These included 126 deaths, though the agency says the devices were not necessarily the cause of death. The FDA makes this information searchable on its FAERS Public Dashboard. Mylan, which owns the EpiPen brand, redesigned the auto-injector in 2009. In the decade and a half prior to the redesign, the FDA had received a total of 256 adverse event reports involving the pens. That total was surpassed in just the first two years after the redesign, with 311 reports sent to the FDA. Between 2015 and 2016, the number of adverse event reports more than doubled from 270 to 660. The EpiPens affected by the 2017 recall were distributed between Dec. 17, 2015 and July 1, 2016, according to manufacturer Meridian Medical Technologies. Complications may occur when an EpiPen fails to function as intended. EpiPens are intended to be deployed into muscles of the outer thigh. The device’s label says injections into the buttocks have resulted in cases of gas gangrene. This is an extremely rare but fast-spreading bacterial infection that causes tissue death and gives off a foul-smelling gas. It can be deadly if not treated. The FDA has received reports of the devices deploying needles too early or not at all. Both malfunctions can result in serious complications. Mylan blamed the 2017 recall on a defective part in the auto-injector that had triggered the needle to deploy prematurely. The defect could also have caused the medication in the devices to leak out before it could be injected. Bloomberg reported in 2017 that failures or malfunctions resulted in more than 220 hospitalizations and were associated with seven deaths through mid-September that year. An accidental injection of epinephrine can cause numbness or tingling around the injection site. It can also increase heart rate or lead to heart palpations. In some rare cases, unintentional injections can cause tissue death. The EpiPen redesign in 2009 addressed the risk of accidental injections in part by modifying the design of the needle cover. With the newer devices, the needle is not exposed before or after use. UNINTENTIONAL INJECTION Call Poison Control immediately at 1-800-222-1222 if you accidentally inject epinephrine into a finger or hand. Few detailed clinical trials evaluate treating anaphylaxis with epinephrine. The EpiPen label says this makes it “difficult to determine” just how often reactions to the drug occur. The label relies on less accurate observational data to determine common side effects. The label warns that these reactions are more likely to happen in people with high blood pressure or hyperthyroidism. Elderly patients and people with heart problems are at greater risk of experiencing more serious side effects such as a rapid rise in blood pressure that can result in a brain bleed. Other rare but serious side effects include irregular heartbeat, heart muscle disease and chest pain from reduced blood flow to the heart. Mylan warns people to seek medical treatment immediately after an epinephrine injection in case anaphylaxis returns once the medication wears off. 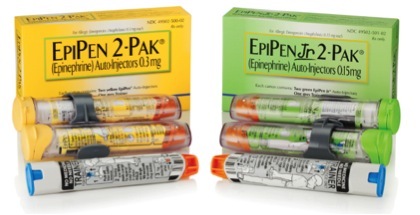 Epinephrine in EpiPens has an estimated shelf life of 12 to 18 months. Expired devices may be less effective or not effective at all in an emergency. Over the past 25 years, the FDA has received more than 600 reports of complications resulting from ineffective devices and more than 300 reports resulting from expired ones. Studies have found epinephrine may still be effective months or even years after the expiration date on EpiPens. But the actual life expectancy of the drug may vary from device-to-device. Researchers and health care professionals still caution people to replace the devices before they expire.